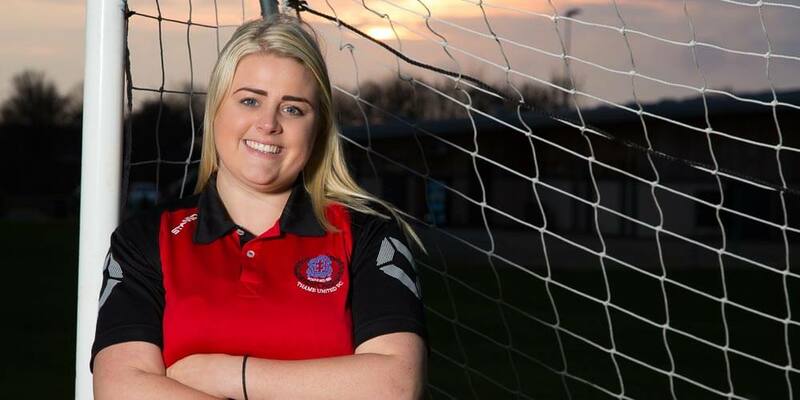 Welcome to another in the series of A Portrait of Thame where this time I had the pleasure of photographing Kayleigh the manager of Thame Ladies FC. Our first meeting was scheduled for the day of a game, but unfortunately the other side were unable to field a team and it seemed pointless both of us travelling to Meadow View Park for the photo shoot that day, especially as the weather wasn’t great. On our rescheduled day the weather wasn’t a lot brighter but at least it was dry. On arrival, the sign outside the main door leaves you in no doubt of where you are as it proudly proclaims ‘Welcome to Meadow View Park, the home of Thame football’. As I do with all my portraits, before meeting Kayleigh at the ASM Stadium, I had in mind the type of image I was looking to achieve. I really wanted something that left no doubt in the viewer’s mind what it is that Kayleigh does. To achieve this, it felt right to go for an outdoor image that encompassed either the stadium or a goal net as well as making use of some of the sky to add some interest to the background. The image you see above is the final resulting image and exactly what I wanted to achieve. It was shot as one image and there is no compositing of the sky in later. We were lucky that just as we moved the goal net into position and I set up my light, the sky broke and gave a brief glimpse of orange on what was an otherwise dull grey day. Knowing that the break in the clouds was unlikely to last long, I quickly metered for the brightest part of the sky, transferred the settings into the camera (I only ever work with a meter and shoot in manual) and then shot a quick test exposure to make sure I had the sky exposed correctly. Taking this portrait with the sun directly behind Kayleigh without some kind of fill in light would have meant that Kayleigh’s face would have been in complete shadow, not a pleasing image. I had brought with me my Canon 600EX flash and my ST-E3-RT transmitter. I have a small adapter bracket which allows me to put a soft box on the front of the flash (the bare flash on it’s own would be too harsh) and I put this on a stand to get the flash up at the 45 degree position for that pleasing shape of the light across the face. Metering of the flash was left up to the E-TTL function built in to the 600EX. I fired off the first exposure, then checked the result before dialling in +1/3rd of a stop exposure compensation. This gave a little extra ‘punch’ to the face and helped to make Kayleigh stand out in the image. My thoughts on the light in the sky not lasting were correct as less than 5 minutes after it started, the orange had changed to a dull dreary grey again. Throughout this A Portrait of Thame session I was talking to Kayleigh not only to try and put her at ease, but also because I love to find out about people and what makes them tick. Kayleigh’s passion for football is clearly obvious. Her history with the sport, how she climbed the ladder to get where she currently is. It is also refereshing to hear that Kayleigh is in the game for what I consider to be the right reasons, having fun. Rarely do you hear someone talk so passionately about something and I wish Kayleigh and the rest of Thame Ladies FC every luck in the future. I’ll make sure to get along to a game sometime soon.